Using balloons to decorate your wedding venue can change the appearance of any room to make the most of space, colours and themes, and can turn a dull lifeless room into a magical and romantic setting for you and your guests to enjoy your wedding reception. Balloons can be used in a never ending variety of ways to add that special touch and combined with ribbons, bows, flowers and lights your wedding venue can be given that 'wow' factor. With a selection of colours and textures you can match any style and décor to your wedding venue from a small room in your home, at an outside venue or up to a large hall and with the versatility of where you can place the balloons come an added bonus. A marquee is a like a blank canvass and balloons in your wedding colours dotted all around and placed on tables will transform a plain marquee into a wonderful and stylish venue. The beauty of using balloons to decorate your wedding venue is that you can use as many or as little as you want and depending on your budget you can be as simple or as flamboyant as you wish. You can give your reception venue a spectacular look with balloons that match your wedding colours or give a particular theme a more realistic look from palm trees to pearls and the timeless classic style of balloons is always a sure fire way of getting that stunning look you are aiming for. Many companies will offer you different packages and most will match your budget and if you are considering doing them yourself you need to realise that not only is it time consuming and more trickier then it looks, but you may end up paying out more money in the long term particularly if you are bursting balloons while trying to decorate. And to be honest, do you really want to be messing about with helium gas and balloons on your special day! However, if you really want to decorate your venue yourself it is always best to do a trial run and ask family and friends to help. You may find out that you are one of the creative ones and manage the balloons with no problems. A sea of balloons can cover the entire ceiling. These can then be pulled down by ribbons and taken home by guests. Balloon arches across the doors and windows. These can be made in a single row or two colours twisted together. Balloons in many shapes can be found such as Bride and Groom figurines, hearts, doves, butterflies and even bells. These can be dotted around your wedding venue. Frame the whole of your dance floor with columns. Have an exploding balloon in the centre of the dance floor to scatter confetti over you while you have your first dance together as a couple. Have the balloons placed in nets on the ceiling and they can released during the last dance above your guests heads. If your wedding venue has a swimming pool or a large pond you can place some balloons to gently float around the water. Make a canopy of balloons over your wedding cake table. Tables settings. Balloons can be bunched together and held with weights from small clusters to clouds that are high enough off the table to not obstruct guests from conversing with each other. The head table can be given an arch or used in the background. Your wedding colours can be extending to the ladies bathrooms by the use of a few balloons. Ask if balloons would be allowed. This would relate more to balloons that have lights inside because of the fire risk. 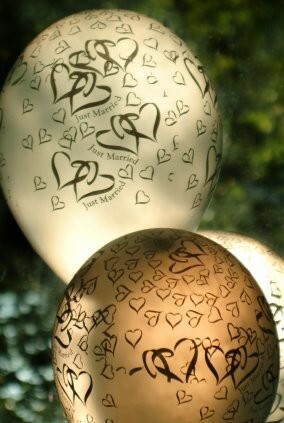 Ask if there is to be a wedding laid out that you can take a peek at to see how much balloons can alter the look. Check if the balloons will be cleared away for you or will somebody have to return the next day to do so. If you are considering putting up the balloons yourself, double check if you can set them up the day before, or even sooner! If you are to have a wedding guest who has a phobia about balloons, you can help by placing them at a table away from any balloon displays. Make a mental note of where balloons can go when you visit your wedding venue for the first time. Your wedding day will be remembered by many for a long time and as well as your dress, wedding colours and flowers, your venue décor will display your personality, style and panache. Look wonderful on your photographs and have your guests talking about how stunning it all looked!